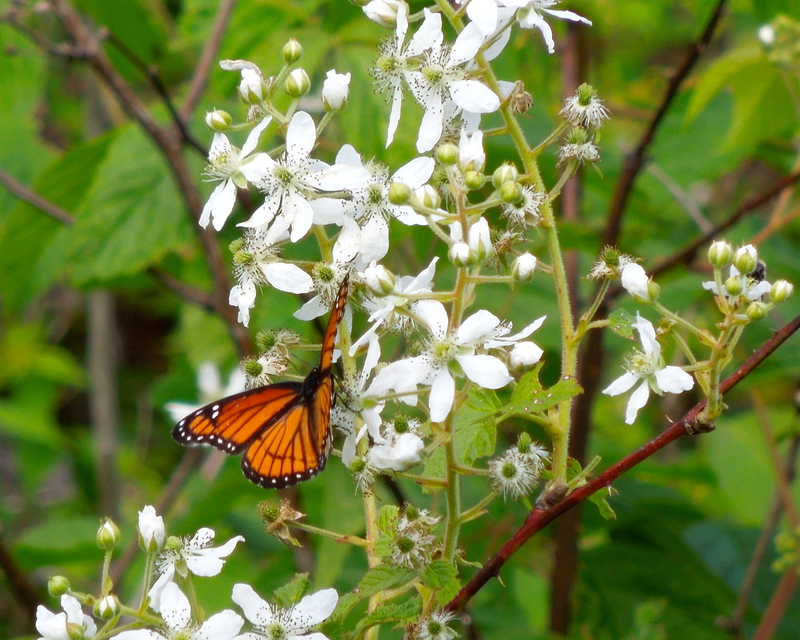 A butterfly pollinates flowers on a raspberry bush. We have a strawberry patch outside our door just as we did at our house in California. Out west, the berries would begin to ripen in January and would produce for a few months until the temperature became too warm and then go dormant until the following winter. In Maine, it is June before we begin to see the first of the strawberries and, if the porcupines and chipmunks don’t get them, we can enjoy them throughout much of the summer. We also have planted raspberries (July), blueberries (August), and lingonberries (September) in our side yard. You would think that would provide more than enough berries for the two of us. That might be true, but to have enough to make jam or freeze for pies, muffins, or pancakes we also take advantage of the wild fruits that grow in the woods and rocky outcroppings around the lake. There is a short hike leading to an old logging road that is home to hundreds of wild raspberry bushes. The fruit is small and can be fragile, but if picked at just the right time can be sweeter and more delicious that anything you can buy in the supermarket. Likewise, wild blueberries abound within a short walk from our house. They are smaller than commercially grown or even the fruit from our home grown blueberry plants, but much more flavorful. Picking wild berries is labor intensive and I don’t do it to save money at the store. There is just something about eating food that you grow yourself or pick in the wild that makes it taste so much better. This entry was tagged Strawberries, wild blueberries, wild raspberries. Bookmark the permalink.